Sturgill Simpson performs at the 2015 Bonnaroo Music and Arts Festival, June 13, 2015, in Manchester, Tennessee. Sturgill Simpson's records have defied easy characterization (Country? Americana? Experimental Southern rock? ), but this year The Recording Academy decided whatever genre he was, he made one of the best records of the year. And that's enough for him. "The fact that there are a million people around the world Googling my name and trying to figure out who the hell I am right now is just enough for me,'' the Kentucky-bred singer said with a laugh during a phone interview Tuesday in Nashville, Tennessee. Simpson's album, "A Sailor's Guide to Earth,'' was the surprise underdog nomination for the all-genre album of the year category alongside blockbuster albums by Adele and Beyoncé when the Grammy nominations were announced Tuesday. It was also nominated as best Country album of the year. Although the album was a critical favorite and topped Billboard's Country Albums chart when it was released, Simpson remains outside of mainstream country music's radar. Not a blip on Country radio, no Country music award nominations, but his music incorporates elements of traditional Country in the vein of Waylon Jennings, while experimenting with jazz, soul, rock and pop. Simpson started his professional career as a musician late in life, after stints in the Navy and working on the railroad and a series of odd jobs throughout the country. His first two records, "High Top Mountain,'' in 2013 and "Metamodern Sounds in Country Music,'' in 2014 framed him as a student of the genre as well as an outsider. The later record earned him a Grammy nomination for best Americana album. 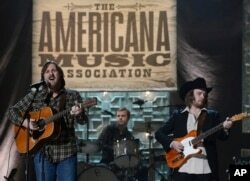 Sturgill Simpson, left, performs during the Americana Music Honors and Awards show, Sept. 17, 2014, in Nashville, Tennessee. But he caused a bit of controversy this year when he posted on Facebook that the Academy of Country Music Awards should not have created an award named after Merle Haggard when he felt they never showed true love to the country outlaw, who died this year. He later added that he felt like he would be "blackballed'' from the industry for his comments. Simpson had developed a friendship with the country icon over the last couple of years of his life. As for whether he still felt blackballed by the industry despite the Grammy nomination, he said he's always had the support of many musicians, producers and engineers in Nashville.